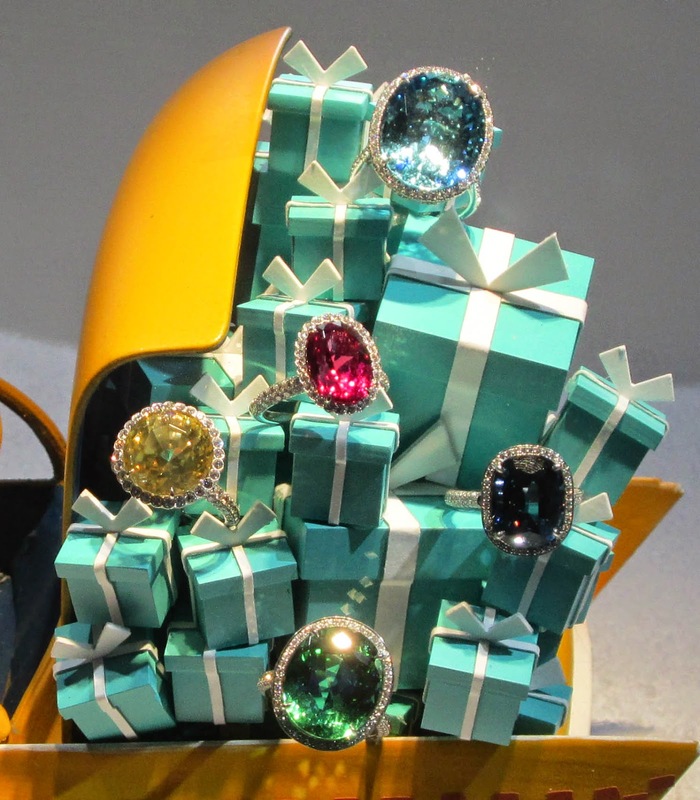 Everything Just So: Christmas in New York 2014: Tiffany & Co.
Christmas in New York 2014: Tiffany & Co. 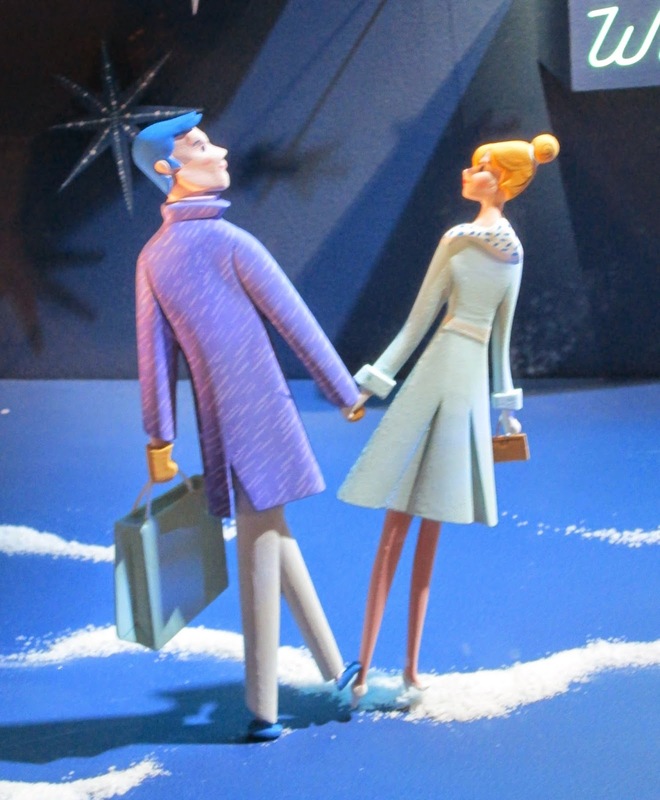 Detail from a holiday window outside of Tiffany & Co, Fifth, Avenue, NYC. November, 2014. Gorgeous! 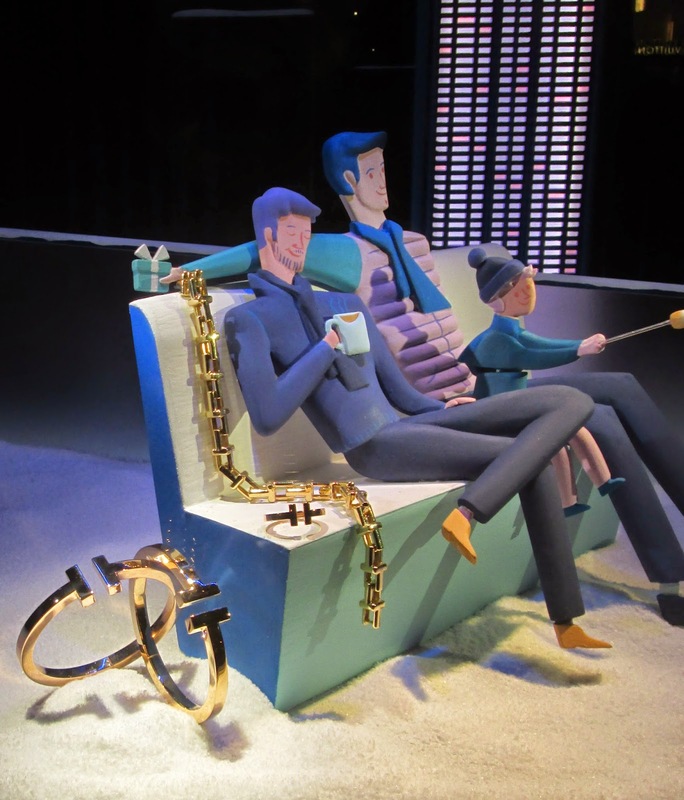 The holiday windows at Tiffany in Manhattan are as charming this year as they were last year and they may even edge out Bergdorf as my favorites for 2014! The outside of Tiffany & Co. is quite sparkly for the holidays! 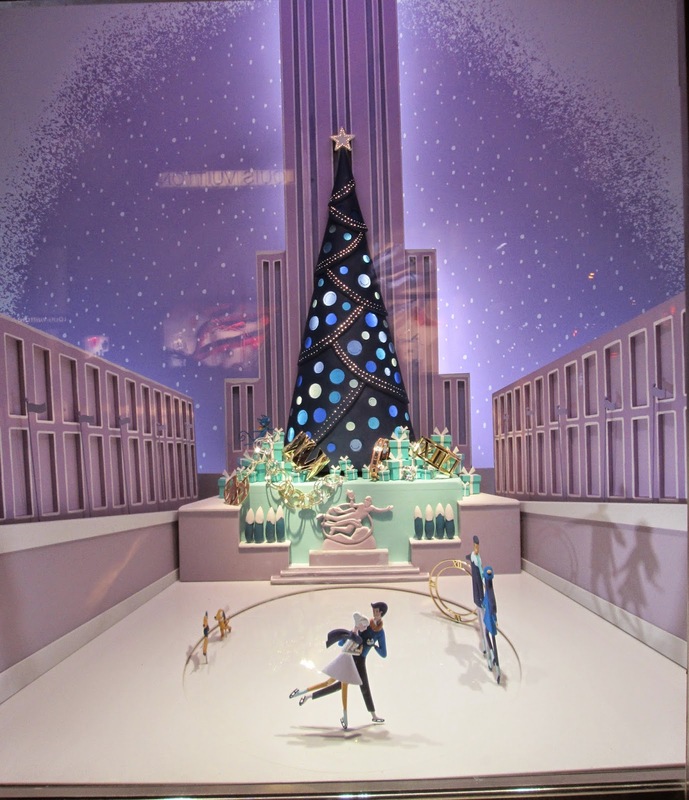 Each window featured a little scene of Manhattan and highlighted holiday traditions, such as the Rockefeller Center Christmas tree and a visit to Broadway, as well as landmark buildings like the Empire State Building, the Flatiron Building, and Tiffany itself! The building was dressed up too, in a wonderful display of lights that looked like New Year’s Eve fireworks with a yellow diamond at the center. Wow! 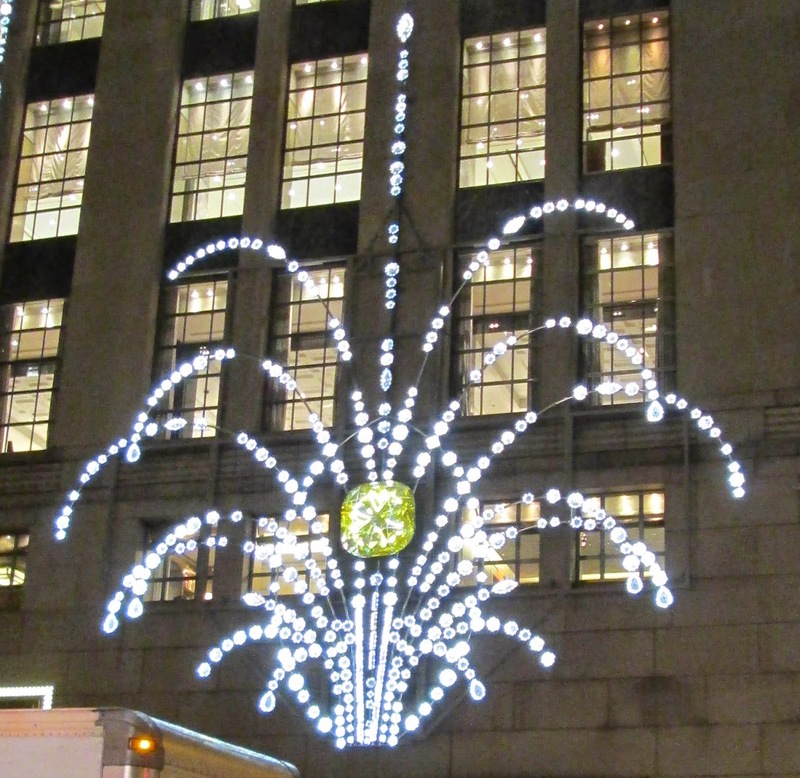 A glamorous Tiffany firework outside the building! Many of the scenes had moving parts, such as little blue boxes that wiggled, a scrolling landscape background, or skaters spinning in a circle. Nestled within each scene—so beautiful in their varying shades of blue, lavender, and white—were gorgeous selections of Tiffany jewelry. My (then) boyfriend and I took a taxi to get married at City Hall so I am a big fan of this window! A great scene of a couple looking at Tiffany windows. The present behind his back moves! The engagement/wedding set they are looking at. Stunning! I loved these skaters who moved around in a circle, in an homage to Rockefeller Center. I also loved these two Babes on Broadway, surrounded by lights and jewels! ...to the clothes on the figurines! On the 57th Street side of the building I noticed a window that must be a first for Tiffany—the scene showed what I’m assuming is a gay couple, perhaps with their child, enjoying cocoa and roasting marshmallows before a fire. What a way to say everyone is welcome at Tiffany’s! ...featuring a gay couple and perhaps their child (and showing off the new Tiffany T collection). There is a sweet little video that shows all these scenes in motion over at the Tiffany home page. Stop by to see it. It will put you in the holiday mood! I do love looking at Christmas store windows and for us Chicagoans we always had the iconic Marshall Field's Flagship store on State Street which now regrettably is a Macy's although many of us can't bring ourselves to utter that blasphemy. **I watched a charming youtube interview with Truman Capote and they were discussing Breakfast at Tiffany's and Truman said everybody always asked him what Tiffany's gave him to thank him for all that flattering publicity and he for years would astonish them and say "nothing". Apparently word got around and Tiffany's did several years later give him a Breakfast (natch) Tea Set for Christmas. Hi GSL, Marshall Fields is now a Macy's? Boo hiss! Do they at least go all out with the windows? As for Truman, oh he was a naughty one, wasn't he, though it seems to me Tiffany's should have given him a lot more than just a tea set. Cufflinks! A watch! They also should have a little altar devoted to him in the store, he did so much for that place PR-wise, and continues to, to this day! NYC at Christmas time must be so magical!! Love the windows and the cool lights on the building. And the gay couple ... heart warming ... LOVE. I rushed right over when I read your comment, Jill! This is a gift...thank you so much...really brought me joy on one hand and a little sadness that I cannot see it first hand...but this is the next best thing. I am also grateful for your friendship and I really hope we can meet in Manhattan some day! Happy Thanksgiving! I will head over to see the Tiffany windows next week & Bergdorf's & Saks. After all these years, I still love Xmas in NYC. I wonder if Tiffany's ever sent Audrey Hepburn (love her) a little something something. Capote originally wanted Marilyn Monroe to play Holly Golightly - that would have been a totally different movie. Hi Rosie! 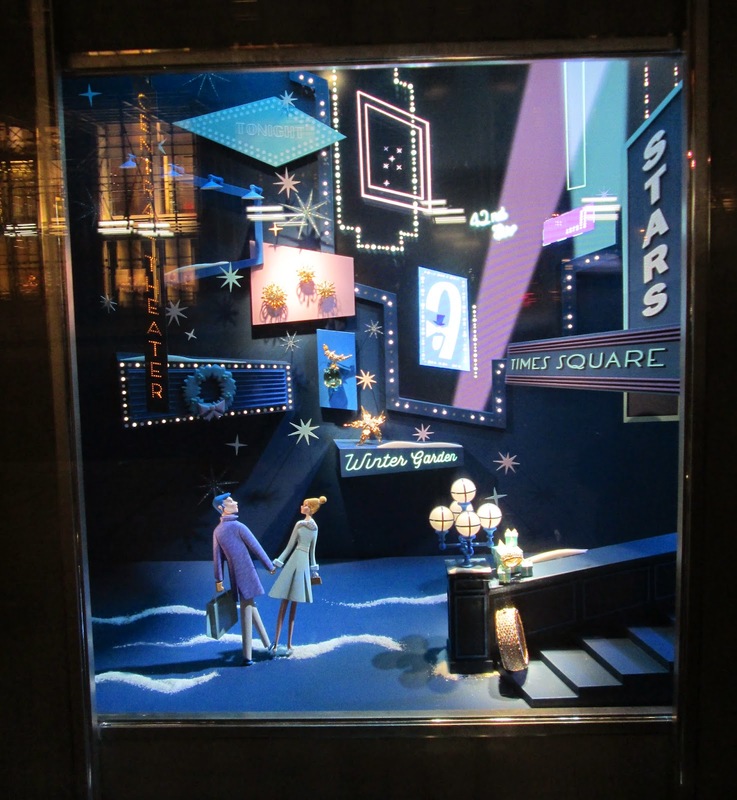 I didn't get a chance to see the windows at Saks or Barney's--it was freezing out last Saturday, a lot like tonight! Let me know if either are worth a trip back. I'm sure they are, actually, I should just plan on it. I can't remember now if I read that Tiffany's gave Audrey something. Just like Truman, what great PR she has given them since that movie was released. I know Truman wanted MM for the role (even though she does NOT fit the physical description of the character in the novella), but I'm with you, what a different movie that would have been. I like it just as it is! I wouldn't want one thing changed about "Breakfast at Tiffany's. Everything was perfection. Can't believe Capote would have preferred Marilyn to Audrey. Thanks so much for remembering my upcoming birthday. If I pass Barney's or Saks this week, I'll definitely let you know if its worth coming in. Hi Rosie! I'm with you, I would not change one thing about the movie. I just watched it again two weeks ago and I still love it. I hope you had fun on your birthday and treated yourself to something special!